Fixed bridges prevent the development of bite problems and save remaining teeth. Help prevent hard foods from causing trauma on the dental ridge in the missing tooth area. Prevent drifting and tipping of adjacent teeth. Posterior bite collapse. Prevent over-eruption of the opposing teeth. Help slow down onset of gum disease (periodontal disease). Help prevent decay in abnormal areas. Fixed bridges replace missing teeth. They are usually made of metal/gold, or where appearance is important, porcelain faced metal/gold. Often, many people who lose a back tooth are inclined to do nothing to replace it. After all, the tooth never was visible. Unfortunately, losing a tooth can start a vicious cycle of destruction. In a normal, healthy mouth, your teeth have a natural balance. Each upper tooth contacts the corresponding lower tooth, allowing for a well-balanced chewing function. Losing a tooth quickly destroys this balance. A functional mouth has 28 teeth (14 upper and 14 lower). They work as a team. Each tooth has three or four companion teeth: the neighbouring teeth and one or two biting partners in the opposite arch. These companion teeth provide support and stability. Drifting, shifting, periodontal disease, and abnormal decay areas are some of the problems that can occur when your tooth loses the support of a companion. Statistics suggest that this neighbour tooth will be lost next. Then, the next closest neighbour is subjected to the same conditions. With each lost tooth, the problems are magnified. The cycle continues. 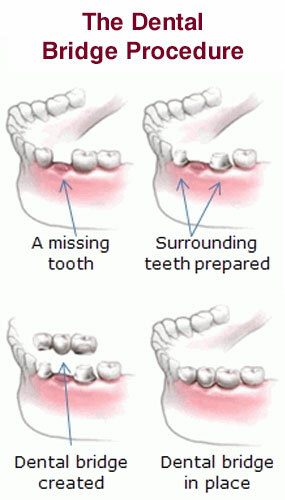 Several things can occur if a tooth is missing and there is no bridge for support. The neighbour teeth tilt, destroying proper functional balance. Drifting teeth create food impact areas where decay starts. Drifting teeth increase the risk of periodontal disease. Bone is destroyed as teeth drift and tip. What will a fixed bridge do? Help balance a normal bite. Help prevent unnatural stress on the dental ridge. Prevent over-eruption of opposing teeth. Prevent drift and tilt of adjacent teeth. Help prevent formation of decay in abnormal areas. Help retard the onset of periodontal disease. How is a fixed bridge attached? Fixed bridges are attached to abutment teeth. Dental restoration called abutment inlays or crowns fasten the bridge to the abutment teeth. The pontic is soldered to the abutment inlays or crowns. Then, the completed fixed bridge (crown abutments and pontic) is cemented in place. The pontic is soldered to the abutment crowns. Then, the completed fixed bridge is cemented in place to restore the natural balance. If you lose a tooth, you can avoid unwanted problems and save your remaining teeth by obtaining a fixed bridge. The best time to do so is immediately after your tooth is lost.